Local Inner Classes are the inner classes that are defined inside a block. Generally, this block is a method body. Sometimes this block can be a for loop, or an if clause.Local Inner classes are not a member of any enclosing classes. They belong to the block they are defined within, due of which local inner classes cannot have any access modifiers associated with them. However, they can be marked as final or abstract. These class have access to the fields of the class enclosing it. 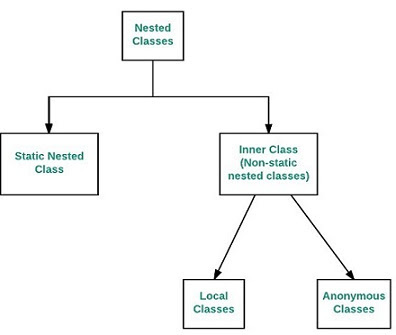 Local inner class must be instantiated in the block they are defined in. The scope of local inner class is restricted to the block they are defined in. Local inner class cannot be instantiated from outside the block where it is created in. Till JDK 7,Local inner class can access only final local variable of the enclosing block. However From JDK 8, it is possible to access the non-final local variable of enclosing block in local inner class. A local class has access to the members of its enclosing class. Local inner classes can extend an abstract class or can also implement an interface. Declaring a Local Inner class: A local inner class can be declared within a block. This block can be either a method body, initialization block, for loop or even an if statement. Accessing Members: A local inner class has access to fields of the class enclosing it as well as the fields of the block that it is defined within. These classes, however, can access the variables or parameters of the block that encloses it only if they are declared as final or are effectively final. A variable whose value is not changed once initialized is called as effectively final variable. A local inner class defined inside a method body, have access to it’s parameters. Because of this assignment statement, the variable sum is not effectively final anymore. As a result, the Java compiler generates an error message similar to “local variables referenced from an inner class must be final or effectively final”. as static. Inner classes are associated with the block they are defined within and not with the external class(Outer in this case).